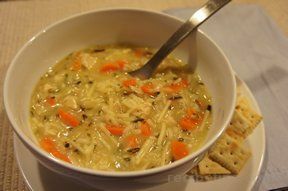 Easy to prepare chicken wild rice soup with the help of a soup mix. Add just a few of your own ingredients for a homemade taste. Heat the margarine until hot and then add the carrots and onion. Cook until onions just begin to brown. Add the water and bring to a boil. Add the chicken bouillon. Add the soup mix and whisk to mix in well. Cooking at a low boil, heat the soup until it thickens. Once the soup has thickened, add the dice chicken and cook until the chicken is heated thoroughly. 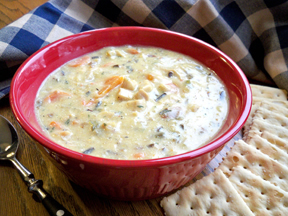 Serve with crackers or you favorite bread. 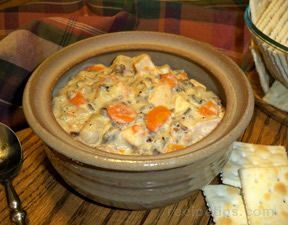 "This was a pretty good chicken wild rice soup recipe for being made with a soup mix. It certainly was easy to make. I still like my made-from-scratch recipe better for flavor but it is a lot more work. When you are short on time, this is a good alternative."